Quack, Quack - BOOM - Splash! We had been talking about a waterfowling trip all summer long. Well, the waterfowl opener had finally come around. Fellow HSC members Brad Birdsell and Dave Deitering, along with myself decided to make the trip up to Mormon Lake near Flagstaff on the Sunday of the opening weekend for duck. We decided that with three of us, one canoe wouldn’t do, so Brad drove up in his Blazer with his Old Town on top, and Dave and I rode up in my Ranger with my Old Town. Brad brought along his two year old black Lab, Sadie for retrieving duties. We met in the IAC parking lot at 3:30 a.m. and hit the road. We arrived on the western shore of Mormon Lake just as dawn was breaking. Guns were already booming across the lake as we watched large flocks in flight over the lake. We couldn’t get the canoes down, and the gear out fast enough! Unfortunately, the western shore is choked with "giggle weed" (my own term) from the muddy shore out for at least a mile before there is open water. 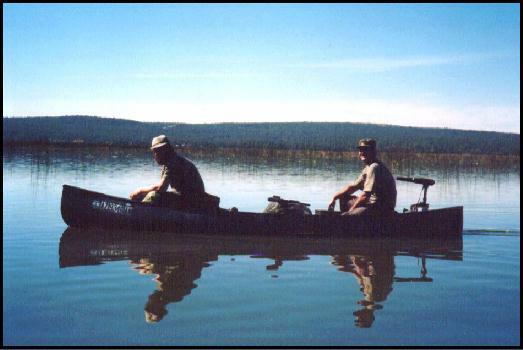 Dave and I had to drag and pole our canoe for at least 200 yards before we had enough water to float the boat. Tough work! I brought along my two-way headset radios. Brad, with less weight and a larger boat, floated earlier and got out way in front of Dave and I. We soon heard a nearby blast, and on the radio, "Got one!" This was Brad’s first waterfowling adventure. I only started chasing quackers last year, and Dave was an old hand. When we finally caught up with Brad, we identified the bird for him as a coot, and explained to him that though legal, coots are not generally hunted because they are considered poor eating. We pressed on through the giggle weed, occasionally jumping up real ducks out of range. We finally found our way to open water interrupted by "islands" of tall weeds. We each brought out a pair of plastic decoys. They come packed as conjugal pairs: a mallard drake and hen. We decided that our best chance was to set out our six dekes in the open water about thirty yards out from a tall weed island and park inside. After waiting around for fifteen minutes or so, a quacker flew over Brad, and he took the shot. It went down in the giggle weed. He paddled out toward where it went down, and when he spotted it, sent out Sadie to fetch. Brad told me about how he had been training this dog from a pup; that Sadie was an accomplished dove and quail retriever, but like Brad, this was her first waterfowling adventure. She sure looked like the classic picture of a duck-dog as she swam back with bird in mouth. We waited around for a while longer, but the action was scarce. We kept hearing booming guns on the eastern shore and saw flocks flying over in that direction. We decided to head further east. We took up another stand in a weed island with our dekes out in the open thirty yards away. Almost immediately, birds in small flights were flying over. Dave and Brad started shooting. At my end of the boat, in my safe shooting zone, I was denied any good shots. With my back to Brad’s boat, I heard a blast, followed by a big splash. "Must be Sadie going to fetch," I thought. I turned around to see Brad flailing around in the water next to his boat. He had fallen out! Turns out that the combination of shotgun blast and a dog leaning in the wrong direction had sent Brad swimming. Actually the water was only stomach deep, probably the deepest it gets anywhere in the lake. The boat never rolled over. When Brad realized that he was at the Point Of No Return, he jumped to clear himself from the boat. Anyway, he crawled back into the boat, waders full of water, recomposed himself, and continued the hunt. He wasn’t in any danger of hypothermia, as air temperatures were in the high seventies. What happened next was pretty amazing. For about the next solid three minutes, large wave after wave of quackers came flying right over us, apparently attracted by the decoy spread. While it never looked like they were trying to land among the blocks, there must have been some reason they were flying over us! BOOM! shucka BOOM! shucka BOOM! (and you thought that was a disco tune). We furiously worked those pump guns, frantically trying to reload as we emptied the guns! Despite all the steel flying through the air, Dave and Brad were only successful in dropping one each. Again, my boat position worked against me with the angle the birds were coming in (I can just hear my companions now, "Yeah, sure, Dan.") The waves of ducks subsided, and wearing big grins, we floated out to retrieve the downed. We stayed at that spot for about an hour with sporadic small flights occasionally coming near. I dusted one and it flew down to the water. It was obviously crippled. Dave and I chased after it to finish it, but it kept diving. We must have chased it for ten minutes before we were able to hit it again on the water. It was a big Redhead. Eventually, as midday approached, the birds stopped coming. We headed back to the trucks to clean the morning’s take, have a bite to eat, and relax. None of us embarked upon the day with any definite plans about when we wanted to get back home, except that we were all planning to be back to work on Monday. So when we got back to the trucks, besides reliving those frantic few minutes of duck shooting delight, the topic of conversation turned to what to do next. I mentioned that when studying the map, I noticed a tank named Ducksnest Lake which sounded kinda promising. Brad mentioned that he knew a couple of local tanks in the area from his explorations during elk season. So we spent the early afternoon driving from dry tank to dry tank. Nothing looked as promising as the shooting we had just come from on the lake. It had been in the back of all our minds, but Dave said it out loud: "I just don’t want to work as hard as we did this morning." Dave was referring to the 200 yards of shallow water we had to muck through, and all the giggle weed. We were all in solid agreement on that point. We drove back to Mormon along the eastern shore looking for a deep water put-in. The road along the eastern shore runs along a high cliff. We could find no easy way down to the water from the eastern shore. As we thought about it, we realized that at no time, did we see any other boats out on the lake. Though we heard plenty of shotgun blasts, we never saw any other hunters at all. We stopped at the vista point at the northeastern corner of the lake, still not sure what we were gonna do. Dave spotted a good looking spot for a put-in on the northwestern shore. "There’s got to be a way to get there," he said. We drove around the north end of the lake and found a dirt road that headed toward the water. The last 500 yards was a little too tough for my 2WD pickup, but Dave and Brad drove down in Brad’s Blazer. We were at the water’s edge with only one watercraft, so Dave graciously offered to stay on shore and take a nap while Brad, Sadie and I went out to meet the evening flights. The boat floated almost immediately as some bemused cows watched us put-in. We paddled out about half a mile and found another likely looking weed island. We set out our decoys and waited. I was in the bow with the Remington 870 across the gunwales in front of me. My eyes were constantly scanning the sky. All of a sudden, from behind me, over my head, a duck appeared. I grabbed the gun, threw it to my shoulder, and BANG! Centered the bird in the pattern! It folded hard and fell into the middle of the decoy spread. There was no time to think. It was a perfectly executed reaction shot honed by many broken birds on the sporting clays course. See! Practice really does pay off! It happened so fast that Brad didn’t know what was happening. "I never saw you move so fast!" he said. It was about a half hour later that our final flight of the day came in. Through the tall weeds, I spotted them flying right at the canoe, broadside to the boat, about fifteen feet off the surface. It was a beautiful sight. Five of them, in staggered formation, heading directly at us! They reminded me of a squadron of high performance jet aircraft flying on terrain-following radar. "Wake up! Wake up!," I hoarsely whispered to Brad. We crouched down, and when they were only about 15 yards out, we popped up and two barrels fired! BOOM! BOOM! Both misses! They veered off to our left. Shucka! Shucka! BOOM! BOOM! Two hits! Splash! Splash! It was glorious! The sun had dipped below the western ridge top by now. We paddled out to meet our birds. The first one we came up on definitely had crosses in his eyes. He was solidly hit. The second one was kicking about twenty yards farther out. Recalling the diving antics of my first bird of the day, I was ready to blast him, but Brad stopped me. He was sure the bird was a goner. And he was right. By the time we got up to the bird, he was done. Two more big, fat Redheads! Noting the absence of the sun in the sky, I suggested to Brad that we call it a day, and he agreed. After gassing up, and a Burger King dinner in Flagstaff, I ended up getting home at 9:30. By the time I unloaded my gear, cleaned the birds, and cleaned the gun (not as bad as Brad’s, which was actually underwater at one time, mine was caked with mud and had started to show some rust on the magazine tube from laying at times in the bilge water on the bottom of the boat), it was 12:30 before I got to bed. Since I got out of bed around 2:45 a.m., I had been up for almost 22 hours. When I closed my eyes, I could still see the water, the tall weeds, and the coots running across the lake surface as they tried to get airborne.